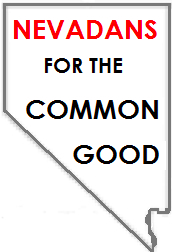 In response to public pressure by 'Nevadans for the Common Good' to expand funding for Meals on Wheels in Nevada, Henderson and Boulder City Councils approved resolutions urging the state legislature and Governor Brian Sandoval to increase state funding for the program by $5 million every two years. Already, the Governor has responded by including $1.5 million in his budget proposal for the food program, a +100% increase over current funding levels. Leaders are pushing for more. Backed by 300 leaders at a 'Nevadans for the Common Good' accountability assembly, Marsha Rodriguez told her story about the fragility of independence as a senior. 72 years old, Rodriguez described waiting 6 months to get into a Nevada Medicaid waiver program, the Home and Community Based Waiver, which helps pay for non-medical services that are essential for some aging seniors to continue living at home. After seven years of receiving non-medical care, she fears that privatization of Medicaid services would reduce access to those services and push her into a nursing home. NCG leader Barbara Paulsen noted that the cost of at-home services for six or seven people is about equal with the cost of covering one person in a nursing home. State legislators in attendance carefully listened and soon followed up with a delegation of NCG leaders, promising that Medicaid privatization of services would NOT happen in 2016, and that the legislative proposal would move more slowly, transparently, and inclusively.